low-cost services to all families. to the kids who need us most. Membership Only $5 Per Year! Become part of the Club’s momentum with an investment in our mission. With your help, more children in our community will be served more often in a safe and nurturing environment. 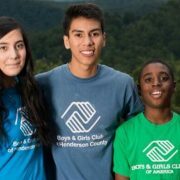 For thousands of young people in Henderson County, Great Futures Start Here! 2019 Event Sponsorship now Available! Over 17 % of our annual revenue is generated through event sponsorship. Join this elite group of hometown heroes, sheroes and businesses in impacting local youth today!